High humidity in rooms and bedding can lead to one of the biggest offenders of all - dust mites. 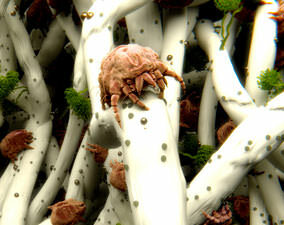 It has long been known that dust mites and asthma are closely related, and studies have directly linked a large number of dust mite species to the allergens that affect humans. There are also studies that link dust mite reduction in the home to a reduction of allergies and asthma. 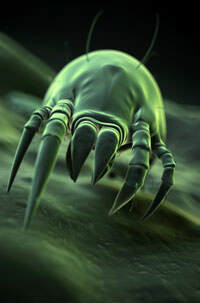 Dust mites thrive in carpets and bedding by feeding on human and animal skin that accumulates there. The mites are so small they cannot be seen with the naked eye but they have sticky feet that cling on to bedding and carpets so that vacuuming them up or even washing is not effective. However, it is actually the faeces of the mite that cause the allergy and this can be vacuumed. The cleanliness of the home or the presence of animals has nothing to do with the number of mites in a home. Their population is determined by the humidity of the home, the temperature of the home, and the amount of fabric or upholstery in the home. They do not survive on vinyl or hardwood floors but are everywhere that dust accumulates. However tenacious, there is one thing that mites cannot do without and that is water. An option that recently proved to be effective and practical was to reduce relative humidity to below 51%. Below this point the mites cannot absorb moisture and they die. Once dead, their sticky feet dry up and they can be successfully vacuumed. Keeping the humidity low may prove difficult. Some studies using low-efficiency dehumidifiers (mostly in single rooms) showed a benefit, while others showed no benefit at all. A high efficiency dehumidifier was generally required. However, if the humidity is too low there will be a drying of eyes and nasal passages, which can lead to other health problems. Therefore a humidity target would be between 35 and 50% and this can only be achieved by regular monitoring of the levels with a humidity meter. Another effective way of killing mites is to freeze them, and therefore if you have room in the freezer, children’s toys or even pillows can be placed in the freezer for 24 hours.